PERFECT FOR 1076 sq ft- 3200 sq ft OR SMALL OFFICES: No dropped calls any more, Better Voice Quality, Faster Uploads and Downloads. Single Display With Single Frequency Amplifier :850MHz. Can Enhances 70db For Your 2G and 3G Cell Phone Signals for buildings up to 2500 sq ft. 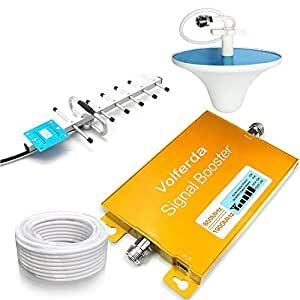 FANTASTIC APPEARANCE: GOLD color for Single Band Signal Booster, White color for Indoor Antenna, Outdoor Antenna and 2 CableS. COMPATIBLE WITH ALL US 2G VOICES Signal and Most US 3G NETWORKS: Works on 2G Verizon, 2G/3G AT&T et. 1.Boosts signal for most U.S. & Canadian cell carriers. 2.Single Display with single Band Signal booster. 1 13m Cable + 2m Cable (White Color).